This post is something I started work on back when I was still blogging at e-elise etc and began life as a series following my journey to find the perfect non-toxic sunscreen. Slowly but surely I'm attempting to make the switch with as many of my products as possible through shopping non-toxic brands as well as trying out homemade versions and as a loyal sunscreen wearer this was an important one for me to get right. Today I wanted to share my thoughts on the different formulas that I tested out last year and which product I'm currently using as an everyday sunscreen. I'm hoping that sharing this post may be helpful to anyone else who has been struggling to find a good non-toxic sunscreen option as I understand how tricky it can be. As ingredients are an important part of the decision I've included links to the products on their brand websites which have full details of these. Of course it's important to note that this post looks at what has worked for me and my skin type and unfortunately what works for me won't necessarily work for everyone. I have to admit, at one point I was just about ready to give up on the whole idea when even having done so much research it still seemed like a non-toxic sunscreen that was affordable, good quality and available in the UK didn't exist. As it turned out I only had to try three different options before I found one that I really love, although of course I'm still always on the lookout in case something new pops up! After doing a lot of reading over on EWG this was the first more natural formula I tried out. Priced at just under £20 for 177ml this SPF 30 sunscreen gives you more product for your money than the other non-toxic formulas I have tried. Appearance-wise I was surprised to find that the product is greyish in colour, having grown up with your average big brand white lotions. It is also fairly runny and has quite a heavy lavender scent. Unfortunately whilst it is easy to apply it can leave a slight chalky tint on the skin and I found that whilst the scent is not unpleasant personally I prefer an unscented sunscreen. The range also includes a facial sunscreen however I didn't end up trying it out as I was a little disappointed with this product. Having said that I do continue to occasionally use this one on larger areas such as my arms when I go walking but still hope to find an unscented alternative that is just as good value for money. After finding that so many products mentioned in the EWG guide are difficult to get hold of in the UK I turned to my own research. Marketed as a facial sunscreen this product from well-known British brand Neal's Yard contains SPF 30 and retails at £25 for a 50ml tube. The sunscreen is pale yellow in colour and has a strong rose scent which similarly to the Goddess Garden formula was something I personally would prefer to not be included. The texture of this product is actually slightly gritty and due to this it can take a little longer to rub into the skin. If you want to avoid an oily puddle it also needs a really good shake before you squeeze anything out of the tube! Whilst this is a nice product and I did use it regularly for a short time I was still determined to find something unscented and smoother in texture so headed back to the EWG guide to search for alternative options. This SPF 28 formula from US company MyChelle Dermaceuticals is completely unscented and most closely resembles the appearance and texture of your average sunscreen. It is white in colour and in contrast to the other two sunscreens shown above it has a very smooth texture, similar to a fairly thick moisturiser which rubs into the skin easily. I have been using this as a daily facial sunscreen for at least six months now and have not experienced any issues that can sometimes be associated with SPF-containing products such as breakouts. As for use on larger areas of skin, the formula seems to work well but a tube like this wouldn't last very long if used regularly for both face and body. At the moment it is still my preferred option of the three, however I would really love to find a more affordable alternative, allowing me to reserve this one as my year-round facial sunscreen. There is one catch though, if like me you live in the UK this sunscreen can be a little tricky to get hold of, however if you shop around you should be able to get your hands on it! I've purchased it from both Naturismo and Amazon in the last year, priced at just under £20 for 68ml. *Update 24/05/17 - Mychelle have let me know that they will be relaunching in the UK later ths year, in the meantime iherb.com is a stockist. 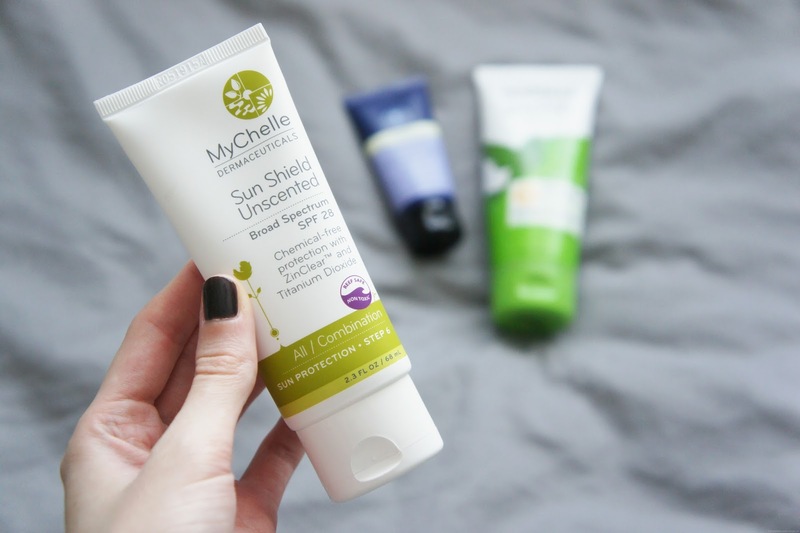 June 2017 - Since publishing this post I have also been testing out Green People's Scent Free Sun Lotion and am pleased to report I'm a fan of this formula! This is where my search for a non-toxic sunscreen has ended... for now at least! If you can recommend any other unscented non-toxic sunscreens please do leave a comment and let me know, I'd love to hear from you.